This crustacean from the Alpioniscus species was discovered during the European Space Agency's CAVES 2012 training program. The ancestors of the terrestrial isopods seem to have evolved from aquatic life to live on land. Surprisingly, the astronauts found a species that has returned to living in water, completing an evolutionary full circle. This image was taken by NASA astronaut Mike Fincke as part of the CAVES training. In training for exploration of the final frontier, astronauts have made a contribution to our understanding of life here on Earth. Over the past few years, astronauts from multiple countries have helped biologists collect specimens of an odd, tiny crustacean during caving expeditions on the Italian island of Sardinia. The little beast, it turns out, was new to science, and it's officially described in a recent paper in the journal ZooKeys. The newly described isopod is different from most of its kin, however. 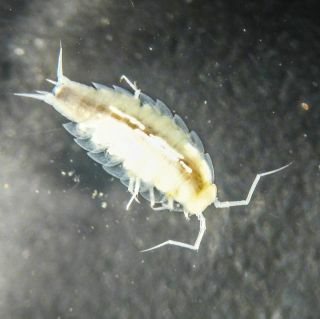 The blind, colorless crustacean, which is less than 0.4 inches (1 centimeter) long, is aquatic, scraping out a living in cave ponds. It was first found during the 2012 edition of the CAVES (Cooperative Adventure for Valuing and Exercising human behaviour and performance Skills), a two-week European Space Agency training course held in Sardinia's Sa Grutta cave system. The experience is designed to help astronauts learn to work together in a space-like environment. The Sa Grutta cave system in Sardinia, Italy, where the European Space Agency's CAVES training course takes place. CAVES prepares astronauts to work safely and effectively and solve problems as a multicultural team while exploring uncharted areas using space procedures. CAVES also involves a variety of other research activities, as the isopod discovery shows. Astronauts from Europe, the United States, Canada, Russia, Japan and China helped collect and describe the little crustacean in 2012 and on subsequent CAVES expeditions. The astronauts' aid is reflected in the little beast's scientific name, Alpioniscus sideralis. "Sideralis" is from the Latin word for "star." "I would like to think that when humans land on Mars and explore its caves, this experience will help them to look for other species knowing that life has few limits and can develop in the most inhospitable places," Paolo Marcia, a zoologist from the University of Sassari in Italy who heads the CAVES biology experiments, said in a statement.